Is this camp or misunderstood genius? The film tries to subvert the usual Western tropes (having Mildred Pierce as the proprietor; having a posse that aren't bad guys), except when the movie gets into some odd spots, and then the usual tropes get trotted out again (including the final shootout and the showdown). There are quite a few Shakespearean expositions to catch us up, but there are still pieces left unresolved. Sometimes it reaches for greatness, but doesn't quite grab it. Johnny: "There's only two things in this world that a 'real man' needs: a cup of coffee and a good smoke." Is it inexplicably titled after a secondary male character to soothe egos threatened by a surprising display of impotence? See Crowther's review: "No more femininity comes from her than from the rugged Mr. Heflin in Shane. For the lady, as usual, is as sexless as the lions on the public library steps, and as sharp and romantically forbidding as a package of unwrapped razorblades." What a bold, often eccentric middle finger to genre and gender conventions. Crawford is pretty spectacular. Too much melodrama and pompous acting for me. The story revolves around an uninspired romance when there's more interesting stuff to focus on. Vienna is a strong female character and yet for some reason the title is reserved for a man who wasn't even the protagonist. The irony is she does go on a justified gender-equality rage for a minute at a certain point but they then cut back to the silly romance again. But that's to be expected from a film that managed to make the climactic siege boring. An incredibly sharp, unique Western - maybe one of the best I've ever seen - with a stunningly good lead performance by Crawford. The kind of quirky movie that many people seem to eat up, but didn't do it for me. 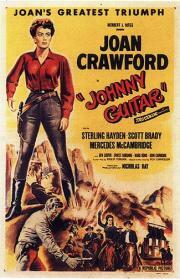 Overwrought, oversaturated western-themed melodrama, with Joan Crawford who rubs me the wrong way. With typical Nicholas Ray style, this Western takes the genre and flips it on its head, generating a troubled revenge drama that is tense and brooding. The lush Western scenery serves as the backdrop for a brutality and ruthlessness rare in early 1950's film, especially in Westerns, which tended to be more optimistic during that time period. It's easy to see the influence this gritty film had on later directors, such as Scorsese or Tarantino, particularly visually.